A Mind of One's Own? Do I have free will? Do you? How did you decide to read that title? Are you going to keep reading? How are you making these decisions? From the ancient Greeks to David Hume, John Dewey and William James, the issue of why we act the way we do has usually been framed as a choice between free will and determinism: Either we're free agents making conscious decisions, or it's all determined in advance, like the eightball has no choice about dropping into the corner pocket if the cueball strikes it thus. However, it's not clear to me that the free will versus determinism debate can really add anything to our understanding, since they seem to be apples-and-oranges incommensurable: Free will is a feeling while determinism is a process. In the real world (as opposed to the realm of philosophy) it doesn't seem to matter much whether or not our actions and thoughts are or aren't determined from one nanosecond to the next. They probably are -- that's pretty much what a scientific, materialist view of the world seems to tell us -- but so what? Would certainty that we're going through our lives as robots make any difference to how we feel and what we do? (Tell that to the jury!) The staunchest determinist would still run out of a burning theater, still feel anxious if a cop pulled them over, still feel guilty for past actions. That's how we're built. So ... lift your arm. Assume you raised your arm. Here's what happened, according to philosopher Daniel Wenger in The Illusion of Conscious Will. He writes, "The experience of willing an act arises from interpreting one's thought as the cause of that act." In his version of events (see diagram) any conscious action starts off with an unconscious cause: Perhaps a pre-existing (deterministic) condition, or maybe a random roll-of-the-dice event. Whatever, call the cause 'X.' 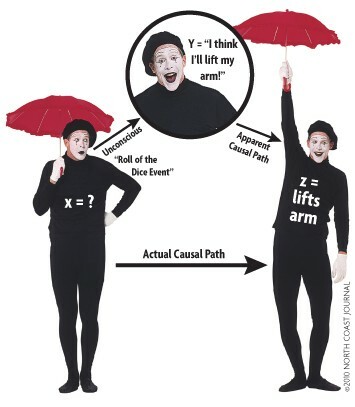 X leads to action Z (arm lifts): the actual causal path. But X also results in a thought Y, "I'm going to lift my arm." This is the apparent causal path. According to Wegner, what we experience as conscious will -- "The User Illusion," as it's sometimes called -- comes about when thought Y and action Z coincide: we assume Y resulted in Z. "I decided to lift my arm and by golly it lifted, so I must have free will!" So: How did you decide to read down to here? Barry Evans (barryevans9@yahoo.com) chooses to believe in determinism. Check out his books at Eureka Books and his travel photos at Old Town Coffee & Chocolates.